MAAX Alaska acrylic tub or shower wall kit is an economical and durable solution for your renovation needs. Installation is quick and easy. It is practical, affordable, and it looks good. The white high gloss finish on the walls makes for low maintenance; simply wipe clean with a soft washcloth. The distinctive design of this 5-piece tub wall kit will enhance the area around your tub. Plenty of storage for your toiletries provided by 6 shelves and 2 towel bars. Your bathroom makeover will be done in a breeze. MAAX Margarita acrylic tub wall kit is an economical and durable solution for your renovation needs. Installation is quick and easy. It is practical, affordable, and it looks good. The white high gloss finish on the walls makes for low maintenance; simply wipe clean with a soft washcloth. The distinguished design of this 5-piece tub wall kit will enhance the area around your tub. Plenty of storage for your toiletries provided by 6 shelves and 2 towel bars. Your bathroom makeover will be done in a breeze. 5 ft. 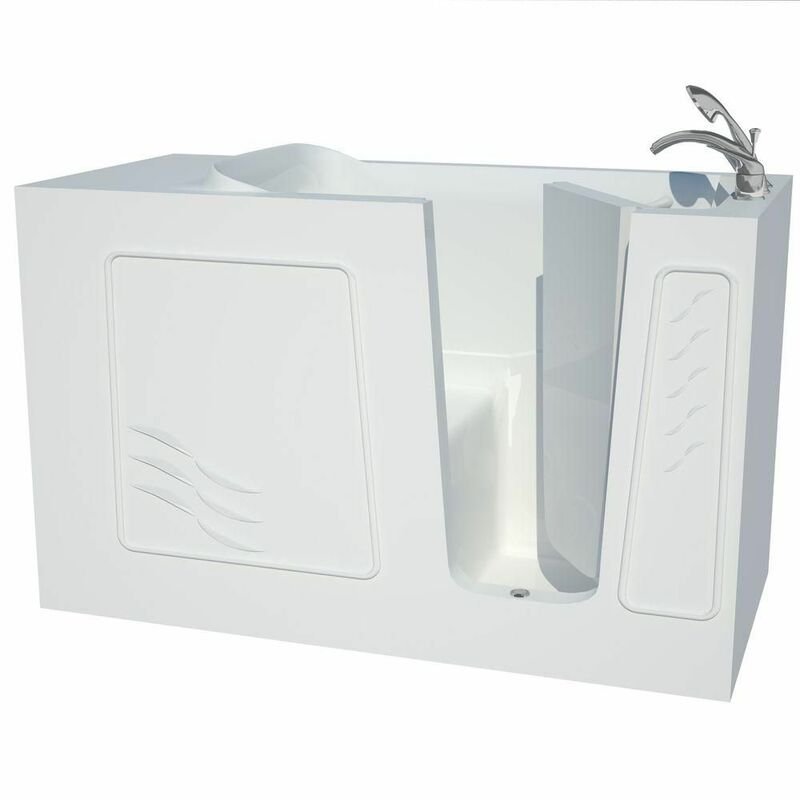 Right Drain Walk-In Bathtub in White Walk-In's provide a safe and independent bathing experience in a cost effective solution. Using the latest in tub crafting techniques and industrial grade materials Walk-In Tubs offer an impressive line to meet your specific needs. With ADA compliant designs and features, Walk-In Tubs offer the satisfaction and peace of mind needed to truly enjoy a luxurious soak. 5 ft. Right Drain Walk-In Bathtub in White is rated 4.3 out of 5 by 6. Rated 5 out of 5 by Renee from We are very happy with this bathtub. It makes bathing... We are very happy with this bathtub. It makes bathing so easy! Rated 5 out of 5 by Jimlanepa from Nice Tub - Not Fancy, exactly meets my needs at the right price. Nice Quality! Nice Tub - Not Fancy, exactly meets my needs at the right price. Nice Quality! Rated 5 out of 5 by Robert from Tub is as described. Delivered on time. Fixtures were unexpectedly... Tub is as described. Delivered on time. Fixtures were unexpectedly included! Installed ourself for 1/6 the price Barh Contractors had quoted and a month quicker. Rated 5 out of 5 by Harvey from Great fun, great value.... Great fun, great value. Rated 1 out of 5 by Fred from Very low quality. You can tell the product comes from China. You can also buy the product direct ... Very low quality. You can tell the product comes from China. You can also buy the product direct from the manufacture on a different web site. Terrible customer service. Stay away from Universal Tubs. Rated 5 out of 5 by greeneyes9 from i bought this tub and had it installed for my eldely mom. It gave her back her independence. This is s great tub , not nearly as expensive as others i looked into. The shower head is easy to reach and use, the seat is comfortable and the faucets are an easy reach. The install was easy and it looks great!! !